Im going to the Saturday game. Anyone want anything watched / reported back? Sure: any of our young Chex look like natural goal scorers? Does McKeown look like he has a chance at the NHL level? And how does Ned look (if he's in net)? Please take my assessment with a grain of salt. Its my first AHL game and its harder to assess hockey players than minor league baseball. I was trying to watch everything (my first mistake). the older players stood out a lot more than the prospects. Miller, PDG, Samuelsson, etc. Miller had better chances than his two goals to score more. He tried to make the extra pass when he deked a defender and was going on goal. 2nd time he tried to be fancy on a breakaway chance and got too deep to take a good shot. Easily the biggest offensive weapon on the ice tonight. He is tenured professional and I expect the prospects to have highs and lows. The whole over passing thing must be an organizational thing or we do a fantastic job at drafting the “extra pass” guys. PDG had 3 assists including a couple of very good passes that gave guys grade A shots. Utica dominated the physical play. Checkers tried and completed some big hits but the majority of the physicality belonged to Utica. Wallmark got another point tonight, an assist. I was hoping to see more of Roy and Zykov physically dominate guys with their size. Their size was obvious out there. It wasn’t there. Ned. What to say about him. If this game was his normal play: man I wouldn’t trust him to handle the puck. He is inconsistent with his puck handling decisions. He looks adequate one minute then the next he is passing it right to a Comet. I think the scorer was generous with giving Utica 26 shots. They were plain awful shooting the puck. They missed a bunch of shots on net by going wide / high. Ned’s one goal was more a testament of their awful shooting than his play. Didn’t even get breakaways on net. The one goal was a deflection off his chest protector right to a Comet. Ned was square to the shooter but he wasn’t able to knock it down. He struggled early with rebounds but got better. He also made a solid save with the glove moving across the crease. He moves well between the pipes and I thought he did well with angles and preventing holes on the short side. Everyones sticks were very active. We had quite a few of break ups and deflections. Mckeown had a great sprawling play on a 2 on 1 that prevented any chances from Utica. TBH I didn’t even know Gauthier played tonight until I saw the box score. Thanks gocanes for the observations from the game. It was a good game from a Chex point of view. I'm curious, how is the overall experience? Getting to the game, the arena and crowd? Overall was good. The crowd was sparse, maybe 40% of the coliseum. That made parking easier. There was a parking lot on the stadium grounds. We parked in the parking lot across the street, with a convenient tunnel under the street. Getting to the game is slightly lengthen due to construction. It was an easy drive from (no hotels within walking distance) our hotel near the airport. Im not a fan of the cowbells. But it is a thing. They do a decent job of getting the crowd into the game. I would say half the crowd was casual fans so the fans noise isn’t loud. Nick Schilkey, Andrew Poturalski and Phil Di Giuseppe all scored in the first 8:58 of the first period of the first-ever meeting between the two clubs. After the Senators pulled one back in the second, Warren Foegele and Valentin Zykov answered back minutes later and Andrew Miller added a final dagger in the third. Alex Nedeljkovic, who was only beaten following a turnover immediately behind his net, made 28 saves to improve to a perfect 6-0-0 on the season. Wallmark, PDG, Miller, Foeglele, and Schickley. Kuok already has a point in one game. It can only be good if Ned's game comes together. Carrick is 1 point away from tying Michal Jordan's record for the Checkers franchise's all-time top-scoring defenseman, and in 80 fewer games. Charlotte 9-3-0 and plus 14. The heavy lifting being done by the older players. Wallmark just keeps putting up points making plays 15 points in 12 games and leading the team at +7. Zykov just keeps scoring goals, now with 8 in 12 games: that's .67 goals per game. (And for people who don't automatically have a frame of reference for .67 goals per game, that would be 55 goals over 82 games pace). Andrew Miller at 5 goals and a ppg over 12 games. PDG with 11 points in 12 games, Warren Foegele with 7 goals in 10 games, and he started on the 4th line and that's .7 gg, or 57 goal pace, and Nick Schilkey with 3G and 5 points in 7 GP. So Zykov has that 44% shooting percentage that likely doesn't keep up. Foegele, actually scoring at a higher rate, is at 27% shooting, also not likely sustainable. They will cool off, but if we need goal scoring we have 2 ready to go call ups in Foegele and Zykov. One would think at this point Zykov would be the guy since he's more seasoned. If we want a playmaker, Wallmark is continuing from last year. It's interesting that Gauthier and Roy, but especially Gauthier, seems to be struggling. I think the AHL is simply a better league, closer to the NHL, than people think, and coming out of Juniors there is an adjustment that has to be made. Look at how out of place Bean looked in camp and pre-season in the NHL. This is why I am so against that 19 yo year HAVING to be spent back in Junior hockey. Look at Fleury. He struggled the first half of last year in the AHL, but steadily found his game and by the end was at a high AHL level. Then he stepped into the NHL without a hitch. Anyway, I think Gauthier and Roy will find their pro game, and when they do....considering that Kuok is getting adjusted back, the Checkers could be scary good. Checkers win again. 4 in a row. Roy scored a shorty. Kuokkanen scored as well. Wallmark didn’t play. Zykov went pointless. Saw this when I went to the Chex home page to access the box score. Sounds like a heck of a deal for anyone who lives close to Charlotte! 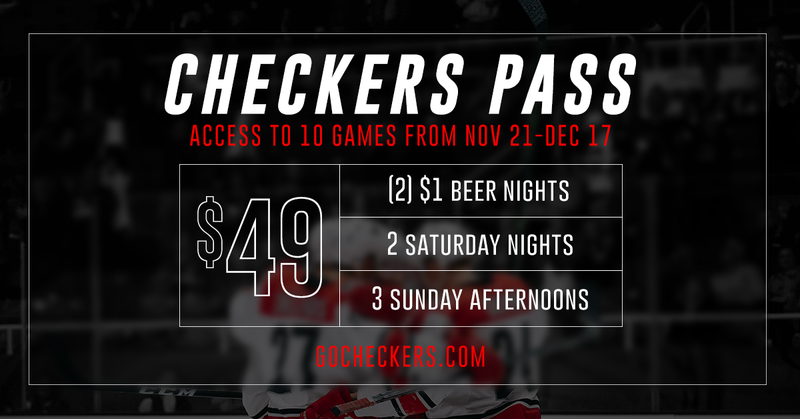 Just bought tickets to go see my first Checkers game! Going on Saturday of Thanksgiving. Any advice on things to do, places to see or eat? Ha just realized I have the Canes vs. Toronto Friday. Who thought a 1030am game on a Wednesday was a good idea? Either way the Checkers lost. 2nd straight 5-3 loss. Game was tied with under 3 minutes left and the Canes took a too many men penalty then a delay of game penalty. Both penalties resulted in PP goals. Zykov scored again, why isn’t he here yet? charlotte scored at least 3 goals in 13 of their 15 games. Charlotte really has a lot of AHL firepower. Wallmark now up to 15 points in 12 games. Zykov 9 goals in 15 games, Foegele 8 G in 13 games. Kuok 5 pts 6 games, (PDG now up had 12 pt 14 gams, and Andrew Miller 14 pt/15 g), Roy seems to be staring to score too. Really just waiting on Gauthier to find it. Your post reminds me again of how much I wish the "Points" stat didn't include secondary assists. Secondary assists seem like they could just as easily be a reflection of the team as of the player, unnecessarily "inflating" the stat when it comes to evaluating how a player is doing. Your post reminds me again of how much I wish the "Points" stat didn't include secondary assists. Secondary assists seem like they could just as easily be a reflection of the team as of the player. I do agree with you. What would be nice is some sort of subjective assessment of the quality part of the play. I was listening to a discussion about this on NHL on Sirius/XM and a good point was made that sometimes the secondary assist is THE play. The guy in question makes a sweet play to get past a guy, then another nice move along the boards, then flips a sweet pass to a guy, who then feeds the goal scorer. Another time I was listening to a stats service that NHL teams hire to find deeper stats and wonder if they keep something like that. Break down the play and assign extra points for quality, or only points for quality. Of course I don't mean in the official stats, but some separate list, more for scouting. I know that company does something like that to help teams decide who to trade for or how much to offer and who to draft. Anyways, for us, we get just the totals. I do think it's hard for a guy to really rack up serious points without at least some skill though. True, but seems like it's infrequent enough that I'd accept missing those in order to weed out the secondary assists that may have little to do with the goal. I'd also love a more refined stat (sometimes an assist "contributes" just as much to producing a goal as goal itself, I'd put Williams highlight pass to Staal in that category), but that doesn't seem very practical, whereas changing Points to include only primary assists just means changing the convention. Yeah that is exactly right about the assist being better than the goal sometimes. I can't remember the name of the company, but that kind of quality measure is what they do. They literally review every goal and even many nice plays that lead to quality chances and rank each player's affect on the play somehow in a proprietary way. But they sell this analysis directly to NHL teams (not sure if the Canes partake). Of course it's not available to us. I'd like it if the official scorer had the leeway to decide if he secondary assist had anything to do with the play and not award it if it didn't. Deadlocked at two heading into the final frame, the Finnish duo of Saarela and Janne Kuokkanen connected once again, with the former notching his second goal of the night on another rocket shot and the latter picking up his third helper on the feed. Went to the checkers game yesterday. Woah. Providence scored the first goal, after which the Checker scored the next 8. I'm seriously exhausted from getting up and cheering goals, just worn out. But really, it was a lot of fun. 16/18 Checker skaters got a point. Checkers won 8-2 and that was with Wallmark and Zykov out for the game. Fun arena. Easy in and out, parking. I didn't sit in all of them, but really seemed like not a bad seat in the house. Very surprised at how many Bruins fans were there. Not like the take-overs at the PNC, but maybe 15% of the crowd. Not much for them to cheer for. After about 5-1 the Bruins fan in front of me started cheering for Checkers goals. The Checkers looked fast, but really both teams skated well. Ned was in net and made some nice saves, but he did give up two goals on 17 shots so .882. Still the guy now has a record of 9-2-0. He was solid. Checker made plays on most of those goals. They were not ugly goals and a few of them were down right pretty. They had Tolchinsky on a line with Gauthier which actually worked, but looked pretty funny when they stood next to each other. Saarela had a sweet breakaway goal. Gauthier burried one. Roy had a sweet no looker from behind the net to the goalscorer. Foegele looked good and had a sweet goal. Carrick looked very solid. McKeown looked good. And on and on. Really nice night. Highly recommend the trip down there. Yes, but apparently followed that up with a 2-1 loss tonight?